LOOK: Is this John Lloyd Cruz's poem for his son with Ellen Adarna? 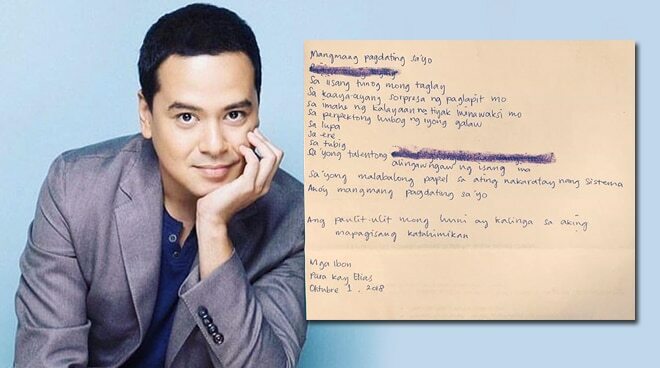 John Lloyd Cruz surprised netizens anew after he posted a poem for "Elias." John Lloyd Cruz had the online world abuzz after posting on Instagram a poem he appears to have penned for his son with Ellen Adarna. Ang paulit-ulit mong huni ay kalinga sa aking mapagisang katahimikan." John Lloyd called the poem, "Mga Ibon" and wrote, "Para kay Elias" underneath, triggering speculations. Allegedly, John Lloyd and Ellen named their son, who was born earlier this year, Elias Modesto. The date of posting - October 1, 2018 - was also written below. John Lloyd and Ellen have yet to address the reports of having a child together.